Miss Berry expresses to Miss Woodberry that she will make every effort to be at Macon on April 15th, but she believes her busy schedule will prevent her from leaving the schools. She thanks Miss Woodberry for the opportunity and will do her best to make the engagement. 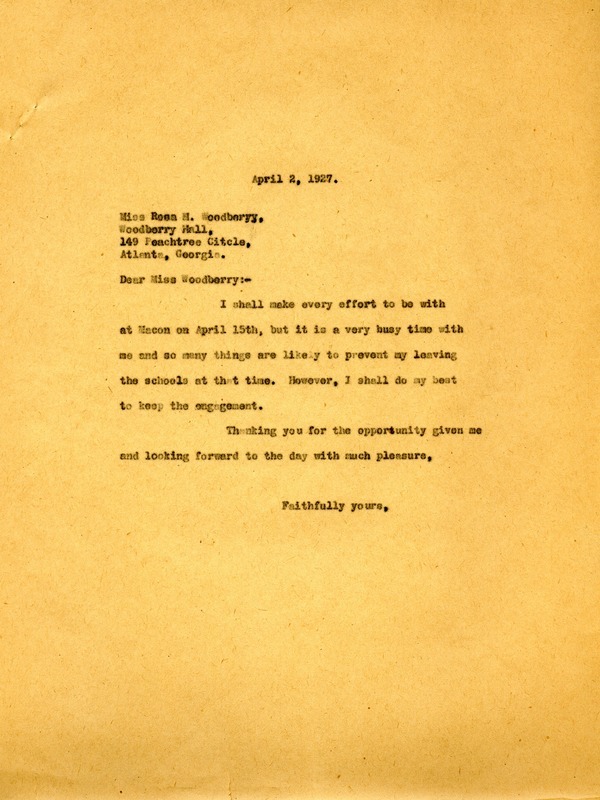 Miss Martha Berry, “Letter to Rosa H. Woodberry from Martha Berry.” Martha Berry Digital Archive. Eds. Schlitz, Stephanie A., Meg Ratliff, et al. Mount Berry: Berry College, 2012. accessed April 26, 2019, https://mbda.berry.edu/items/show/6296.